Advantages: New information for modellers, informative easy to read text, large format photos, superb artwork. The movie “Flyboys” will introduce a new section of the general public to the name Lafayette. They will marvel at the combat, be mesmerized by the special effects but will they know the real story of these men and machines….probably not. To coincide with the release of this Hollywood film, Albatros Productions have released a book that will help set the record straight. Don’t be fooled into thinking that this publication is simply a rehash of previous information. New data has been included that will change the way you look at the next Nieuport you build. Jon Guttman has written about this subject before and is highly qualified to contribute here. The story weaved by the author is both entertaining and informative. Not only are the activities of these pilots discussed but also their personalities. This makes fascinating reading as the reader gets drawn into the lives of a “con-artist”, “international mercenary”, “trouble maker” and “alcoholic”, just to name a few. And of course who can forget the two lion cub mascots….whiskey and soda. In what is a first for a “Datafile Special”, the publishers have seen fit to present the general arrangement drawings solely in 1/32nd scale. This is done to help out modellers of the Special Hobby and Hobbycraft kits in these dimensions. There are 8 pages in total that cover the Nieuport 11/16/17 and 21. Enthusiasts should note that these are revised, not repeated, versions of Ian Stair’s original 1993 GAs that appeared in Jack Bruce’s “Nieuport Fighters Vol 1”. Over 55 archive photos appear within the 40 A4 size pages (excluding the plans). A hallmark of the series is the reproduction of the images. These are as good as the source material allows and in some cases are displayed one or two per page. There are plenty of informative captions associated with the images and these are always enlightening. Modellers of these famous aircraft are in for a treat and this is where some “revisionist” profiles appear. Thanks to recent research by Alan Toelle and Bernard Klayelé, the colours, and indeed the schemes of early Nieuport aircraft have been subject to an about face. These two leading authorities have lead to Bob Pearson creating 35 all-new profiles. The artwork is superb and along with Robert Karr’s stunning cover, provides plenty of inspiration for the student. 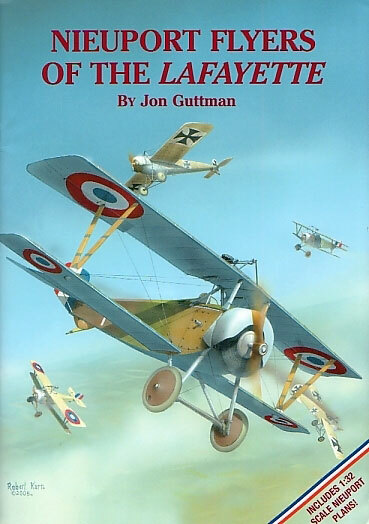 Albatros Publications continue to add to their extensive range of aviation literature. By following their tried and trusted method of presentation, the publisher has put together a title that will please both modeller and non modeller alike. With the release coming on the coat tails of the aforementioned Hollywood film; it’s sure to introduce a new breed of modellers to the fascinating world of WWI aviation.